This excellently illustrated book aims to equip dentists, oral surgeons, and trainees with the detailed knowledge of anatomical variations in the oral region that is now required for optimal daily clinical practice. The book opens with an introductory section on anatomical variations from the point of view of different clinical practitioners ? oral and maxillofacial surgeons, periodontists, and endodontists. The newest anatomical knowledge and variations are then presented in turn for the mandible, maxillary sinus, hard palate, floor of the mouth, lips, temporomandibular joint, and teeth. In each chapter, clinical annotations are included in order to enhance understanding of the relationships between surgery and anatomy. The internationally renowned authors have been carefully selected for their expertise in the topics that they discuss. Anatomical Variations in Clinical Dentistry will be invaluable for general dentists, endodontists, periodontists, and implantologists and will also be an asset for anatomists, oral and maxillofacial surgeons, otolaryngologists, dental students, and dental hygienists. 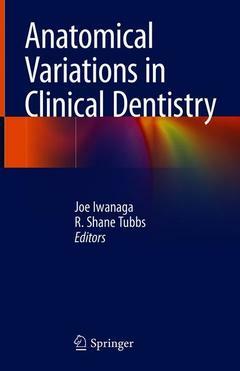 Different Perspectives of Anatomical Variations in Dentistry: Anatomical Variations from the Point of View of Oral and Maxillofacial Surgeons.- Anatomical Variations from the Point of View of the Periodontist.- Anatomical Variations from the Point of View of the Endodontist. Mandible: Anatomy and Variations of the Pterygomandibular Space.- Anatomy and Variations of the Retromolar Fossa.- Anatomy and Variations of the Mental Foramen.- Variant Anatomy of the Mandibular Torus. Maxillary Sinus: Anatomy and Variations of the Floor of the Maxillary Sinus.- Anatomy and Variations of the Posterior Superior Alveolar Nerve/Artery. Hard Palate: Anatomy and Variations of the Greater Palatine Foramen.- Anatomy and Variations of the Incisive Foramen.- Variant Anatomy of the Torus Palatinus. Lingual Plate and Oral Floor: Anatomy and Variations of the Submandibular Fossa.- Anatomy and Variations of the Sublingual Space.- Anatomy and Variations of the Lingual Frenulum and Sublingual Surface. Lip: Anatomy and Variations of the Frenula of the Lips.- Anatomy and Variations of the Lips. Temporomandibular Joint: Anatomy and Variations of the Temporomandicular Joint. Teeth: Variations in the Number of Teeth.- Tooth Anatomy and Variants.- Abnormal Tooth Eruption.